We’re the company you see on television, hear on radio, and read in the paper. 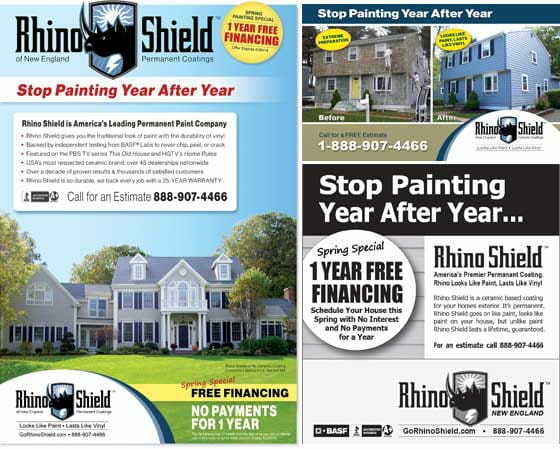 Rhino Shield of New England promotes their message on the top media outlets in Boston, Hartford and Providence. Channel 2, New England Cable News, and WFSB-TV Channel 3, WTNH-TV Channel 8 in Connecticut. respected publications throughout New England. RADIO: Hear Mat and Pat, (the owners of Rhino Shield NE), on WBZ-1030, WEEI, The Sports Hub, WROR in Boston, WTIC-AM in Hartford Connecticut, and on WPRO in Providence Rhode Island.